It’s just gone under the hammer for 1.65 million. It first sold for long ago. You’re rich John, well isn’t that real flash? While we raise a glass down here? To reproduce just as it seemed. Pandemonium [oil painting], John Martin, 1841. Louvre Museum. 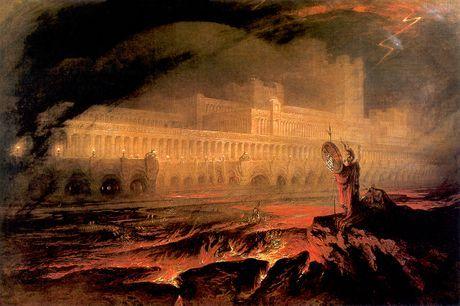 After a long period in relative obscurity, (for example, in the 1930s very large and once famous paintings by him were sold for as little as £2) the name of John Martin was suddenly hugely popular again in artistic circles, when his painting ‘Pandemonium’, based on Milton’s ‘End of the World’ and one of a series of Martin paintings inspired by ‘Paradise Lost’, sold for a record £1.65 million at Christie’s, in London, on February 19th 2003, having originally sold for just 180 guineas in the 1840s. Major exhibitions of his works are still mounted and he is well represented in the Tate Gallery, London, and the Laing Art Gallery, Newcastle-upon-Tyne.